I was a little bit confused when I first read the name Rhubarb Cream Soda because a rhubarb-flavoured cream soda is just not a thing that exists in my world. 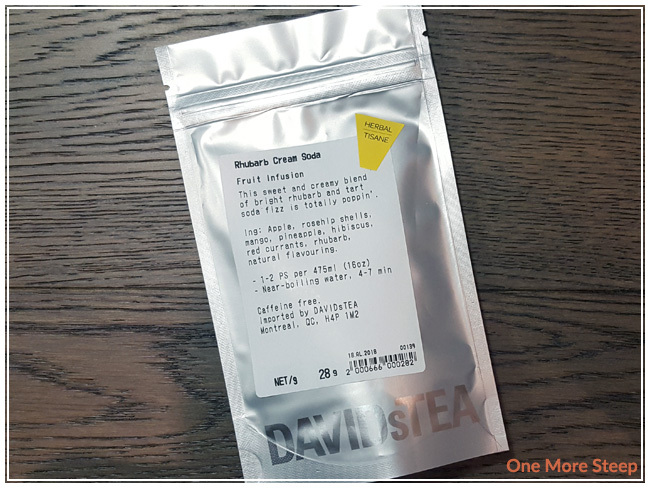 This was another of DavidsTea’s new releases that I first sniffed in store and got a small sample back to try out at home. The aroma of Rhubarb Cream Soda is mostly fruity – I can definitely make out the apple and mango, there’s also something that reminds me a little bit of coconut but I’m not sure what’s that from. Rhubarb Cream Soda consists of: apple, rosehip shells, mango, pineapple, hibiscus, red currants, rhubarb, and natural flavouring. Perhaps the natural flavouring is where the coconut aroma is coming from? DavidsTea’s recommended steeping temperature is “near-boiling” for 4 to 7 minutes. I did an initial steep of Rhubarb Cream Soda for 5 minutes in 93°C (200°F) water. Rhubarb Cream Soda steeps to a very cheerful bright pink – I attribute the pink to the rosehips, hibiscus, red currants, and rhubarb. The aroma is sweet and fruity, I can still smell the apple and mango, but there’s also another depth of layer in the fragrance that reminds me of cream soda. There was quite a bit of an oil slick across the surface of this infusion when I poured it into my tea cup. I’m not sure which ingredient it’s from, I think some of the natural flavouring might have been in the form of oils and that’s why it’s there. The taste of this fruit infusion is actually really surprising. It actually tastes like cream soda! I’m not sure which of the ingredients is the reason for this, but I’m not complaining. 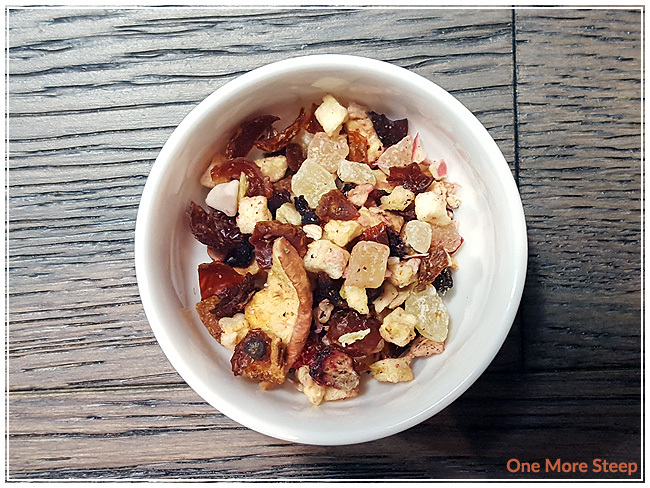 The rhubarb and hibiscus are both definitely present – there’s just a touch of tartness with this fruity infusion. There’s some natural sweetness from the fruit, and the (magical) cream soda flavour that is quite strong. I would honestly recommend having Rhubarb Cream Soda mixed with some soda water to add some bubbly to make it more like a cream soda. I would also recommend having this one iced. 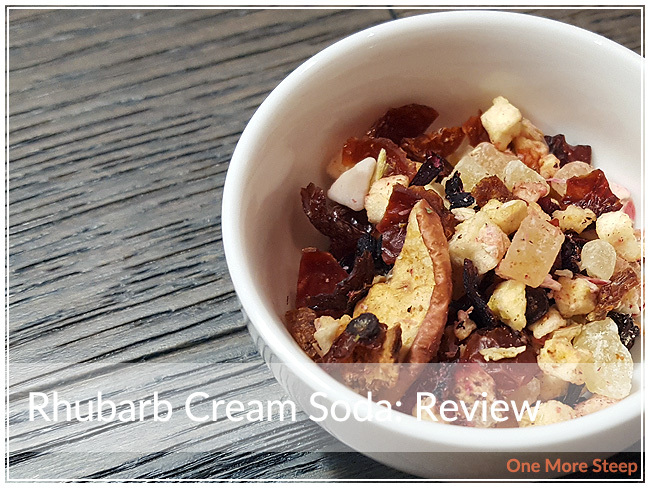 I attempted to resteep Rhubarb Cream Soda and found that it was a no-go. The flavour just wasn’t there the second time around. I liked DavidsTea’s Rhubarb Cream Soda. 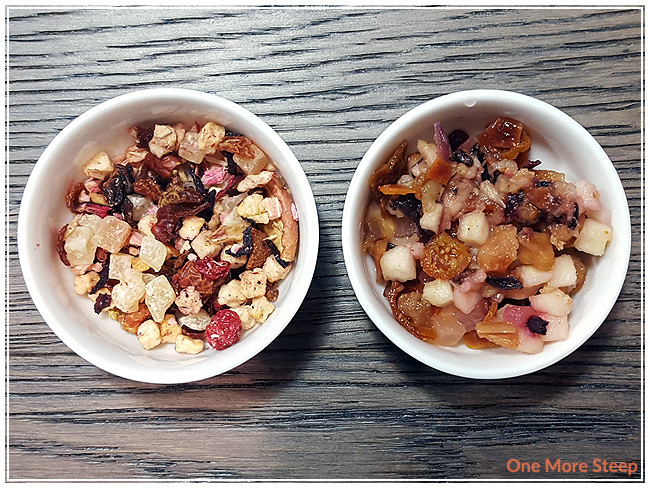 The flavour was pleasantly just like the name suggested, which is always a big bonus when it comes to fruit infusions. I really enjoyed the flavour of Rhubarb Cream Soda, and wish that it was something that resteeped a little bit better. 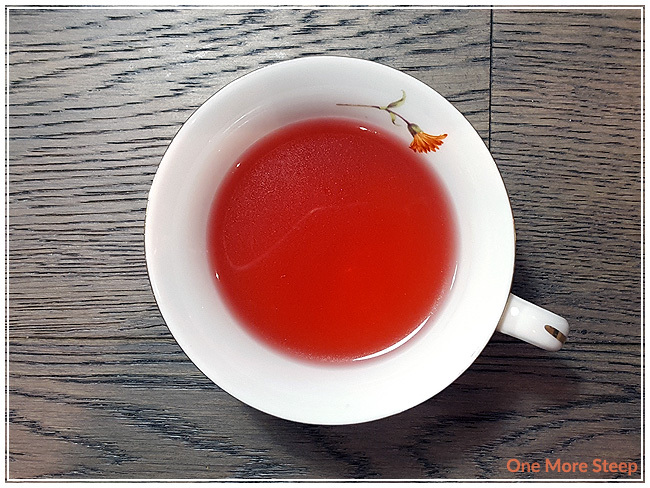 Because this is a fruit-heavy tisane, I found that I didn’t get a lot in my bag because it’s a heavy/bulky blend – which means it makes for an expensive cup. I bought 28g of Rhubarb Cream Soda and probably used a quarter of the bag just for one cup. That said, Rhubarb Cream Soda is a fruit infusion that tastes like its name suggests, so it’s worth giving it a try!